Several of my paintings will be exhibited at the John L. Scott Realty Office in Ashland during January 2015. Drop by and see them. As of July 27, 2014, my work is no longer showing at the Ryan Gallery in Lincoln City, Oregon. I am grateful to the gallery for displaying and selling my work for 10 full years. We have had a good relationship but my sales dropped off the last couple of years so this was a business decision. Some of my images appear on the Your Gallery website which is part of the London based Saatchi Gallery. I did the Images below for DOGS FOR THE DEAF as part of a national promotion. 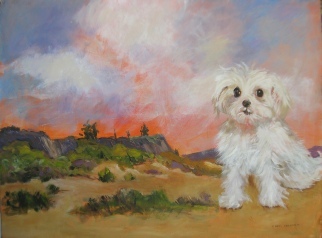 DFD held a raffle and the winner got the painting with his dog included and a case of wine with the painting as the label. 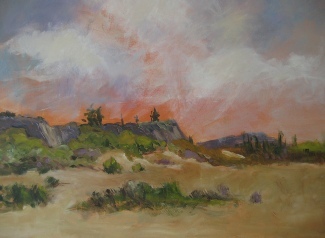 The background is a view of the Table Rocks behind the DFD facility in Central Point Oregon.